The Journal of Cellular Biotechnology is a peer-reviewed international journal for advancing research activities in the field of cellular biotechnology. It serves as a medium for the publication of full papers, invited reviews, short communications, technical notes and letters to the Editor-in-Chief on all aspects of cellular biotechnology. This comprises molecular biological topics covering biochemical, chemical, pharmacological or bioprocess engineering aspects, as well as the development of novel biomaterials. Therefore, cellular biotechnology differs from biology, biochemistry, and other basic life sciences by its emphasis on using the knowledge of bioscience to solve important practical problems. Papers presenting information of a multidisciplinary nature - not suitable for publication in a journal devoted to a single discipline - are particularly welcome. 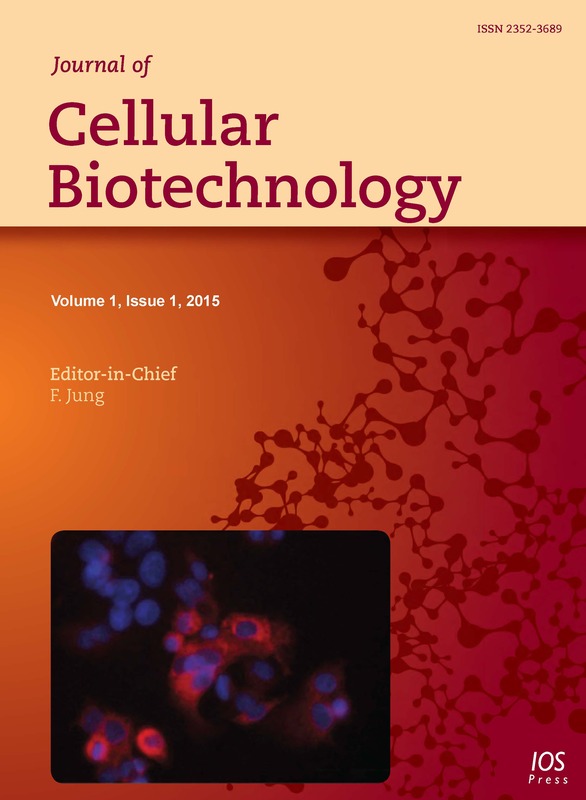 Manuscripts submitted for the Journal of Cellular Biotechnology are expected to cover activities related to molecular diagnostics, the expansion of human primary cells for individualized therapies or drug testing, 2- and 3-dimensional co-culture techniques, cell line validation, tissue engineering, and stem cell biology for the treatment of human pathologies. This includes studies on the design of reactors and research on cellular biology and physiology of mammalian cells in vitro and in vivo, and tissue. Of special interest is the rational manipulation of reactions through metabolic engineering techniques or specific reactor operations that lead to biomaterials with unique properties. Also, biochemical and physiological studies of metabolism and enzymes as relevant for tissue culture cells, investigations at the molecular level including transcription/translation control; design and engineering of products by molecular strategies; engineering of cellular modification and transport systems such as post-translational protein modifications as well as protein and metabolite secretion; molecular strategies of screening for new or modified products (e.g. pharmaceuticals or bioactive compounds). In addition, investigations in preclinical animal experiments are welcome. The endeavour of the Editor-in-Chief and publisher of the Journal of Cellular Biotechnology is to bring together contributions from those working in various fields related to cell-cell or cell-material interactions all over the world. The editorial board members of the Journal of Cellular Biotechnology are from those countries in Europe, Asia, Australia and America where appreciable work in cellular biotechnology is being carried out. Each editor takes responsibility to decide on the acceptance of a manuscript. He/she is required to have the manuscript appraised by two referees and may be one of them himself. The executive editorial office, to which the manuscripts have been submitted, is responsible for rapid handling of the reviewing process. Number figures according to their sequence in the text. The text should include references to all figures. Each figure should have a self-explanatory caption. Colour figures can be included, provided the cost of their reproduction is paid for by the author.Color figures are free in the electronic version of the journal. Number tables according to their sequence in the text. The text should include references to all tables. Name, postal address, phone number, fax number and e-mail address of the corresponding author.